I want to encourage you by sharing some of the lessons I learned along the way. They are not presented in any particular hierarchical order, however they do cross over and blend themselves together like threads in a tapestry. 1. God wants to communicate with us. 2. Faith is an action verb, as well as a noun. 3. God's love is limitless. God wants to have a relationship with each and every one of us - you and me. Part of that relationship is communicating with us. On earth we communicate with people around us all the time, especially those with whom we have a relationship. Communication occurs by both written and verbal words. It's no different with God, as we are all created in His image. We can hear God communicate if we listen. As a multi-time bench press national champion and world silver medalist, Pat has experienced the strength of God's love and the impact of her faith on her accomplishments. You will be astonished at what God has enabled Pat to accomplish in her first two years of competing. 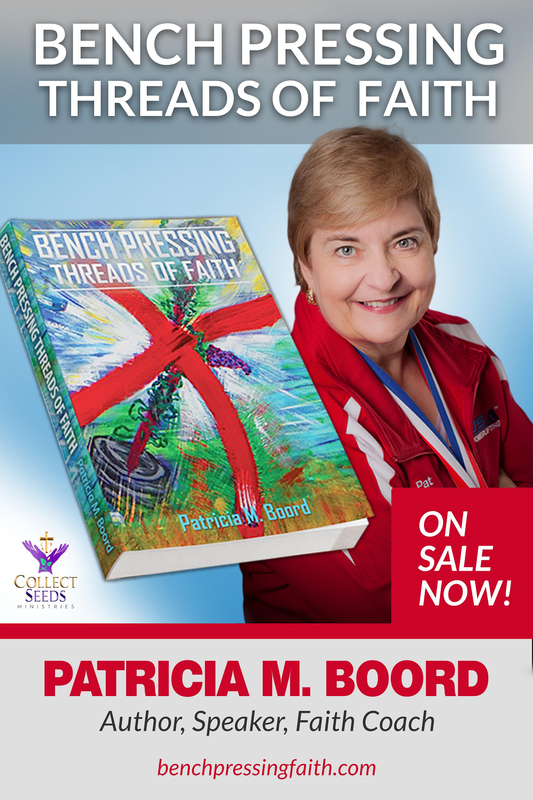 Through Pat's stories, she will demonstrate the power that faith has had in her life when facing everyday obstacles...the frustrating, the poignant and the tragic.